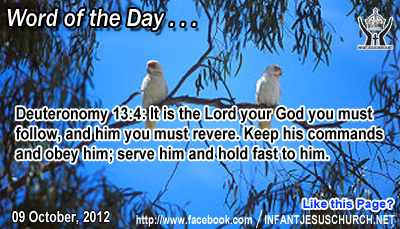 Deuteronomy 13:4: It is the Lord your God you must follow, and him you must revere. Keep his commands and obey him; serve him and hold fast to him. Heavenly Father, help us to take our worship outside the church building into our day to day life as we try to live what we pray, practice what we say, and pursue what we pray. In Infant Jesus' name. Amen. Mary, in her simple and unquestioning manner, waited on Jesus by sitting carefully at his feet. She intuitively knew that what the Lord and Teacher most wanted at that moment was her helpful presence. Nervousness and preoccupation keep us from listening and from giving the Lord our complete attention. The Lord bids us to give him our anxieties and worries because he is dependable and able to meet any need we have. His grace frees us from unnecessary concerns and preoccupation. Do we seek the Lord attentively? Jesus, to be in your presence is life and joy for us. Free us from unnecessary concerns and worry that we may give you our complete love and attention.